October 2017 Android Distribution Statistics - Oreo Shows Up At 0.2% - AndroGuider | One Stop For The Techy You! 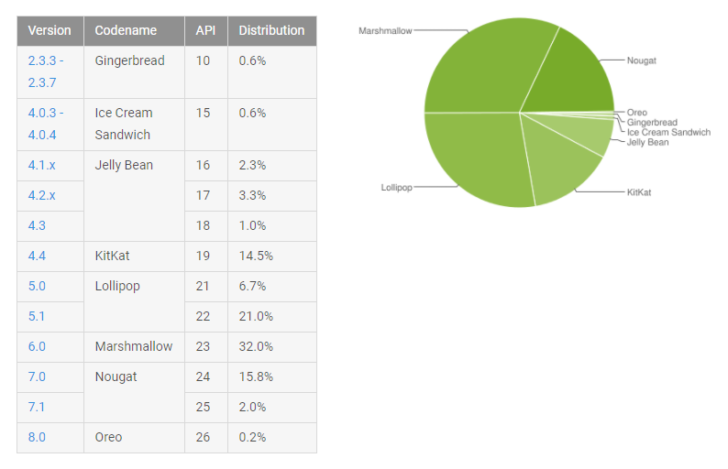 Every month Google releases statistics to the developer dashboard showing the distribution of various Android versions in relation to each other. The statistics for October are out now and Oreo, which was released a little more than a month ago, has shown up at 0.2%. As compared to last month, Nougat 7.0 is up from 14.2% to 15.8% and Nougat 7.1 has seen an increment to 2% from 1.6% last month. This gives Nougat an overall increase of 2% this month. Older Android versions like Gingerbread and Ice Cream Sandwich are on the verge of extinction at 0.6% each. In fact, both Gingerbread and ICS were placed at 0.6% last month.